The Obama administration’s Department of Justice reportedly failed to interview an undercover FBI informant in a Russian nuclear bribery case before filing criminal charges against a top Russian official — the latest government failure connected to the Uranium One scandal. The Hill reports that under the guidance of Maryland’s then-chief federal prosecutor Rod Rosenstein — now the deputy attorney general at the DOJ — prosecutors handed up an indictment of Russian energy exec Vadim Mikerin by portraying William Campbell as the main victim of Russian bribery and deceit, just as the Russians tried to involve themselves in the American uranium industry. This would backfire when prosecutors did eventually interview Campbell in 2015 and learned about the broader extent of his undercover activities with the FBI, undermining their claim that he was, in fact, a victim and causing them to recast the case. Mikerin was a top executive of the Russian energy giant Rosatom and the man who was sent to the U.S. to coordinate Russia’s plans to grow uranium sales in the U.S. The Hill’s reporting comes as DOJ officials are answering questions from Congress in relation to growing scrutiny about the Obama administration’s approval of the 2010 sale of Canadian firm Uranium One — particularly how much government heads making the decision knew about Russian bribery when the decision was made and the role played by then-Secretary of State Hillary Clinton. Government Accountability Institute (GAI) President and Breitbart News Senior Editor-at-Large Peter Schweizer broke the Uranium One scandal in his 2015 book Clinton Cash: The Untold Story of How and Why Foreign Governments and Businesses Helped Make Bill and Hillary Rich. In the book, he reported that nine foreign investors in the deal gave $145 million to Hillary and Bill Clinton’s personal charity, the Clinton Foundation. 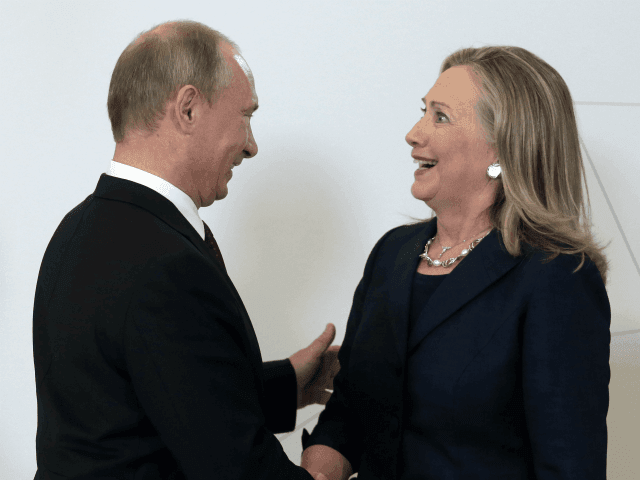 According to the Hill’s latest report, DOJ officials proved that the Russian energy giant Rosatom was engaged in criminal activity through its top American executive as early as 2009, before the administration ok’d the Uranium One sale to Rosatom. But when they filed the first complaint against Mikerin in 2014, they had not yet interviewed Rosenstein. Campbell was debriefed after the charges were filed, but not brought before the grand jury that would indict Mikerin. When they interviewed him again, they realized his work for the FBI was more extensive and changed their goals. “Based on what was learned, we decided to change the theory of the case. … A plea deal became our goal so we wouldn’t have to litigate or make an issue of some of the stuff he had done for [counterintelligence] purposes,” a source directly familiar with the case told the outlet.